In my previous blog posting, I explained that a writer friend suggested eighteenth century France was an unromantic setting for novels. Since I have long been fascinated with that era, it stirred in me a potent desire to alter her opinion. 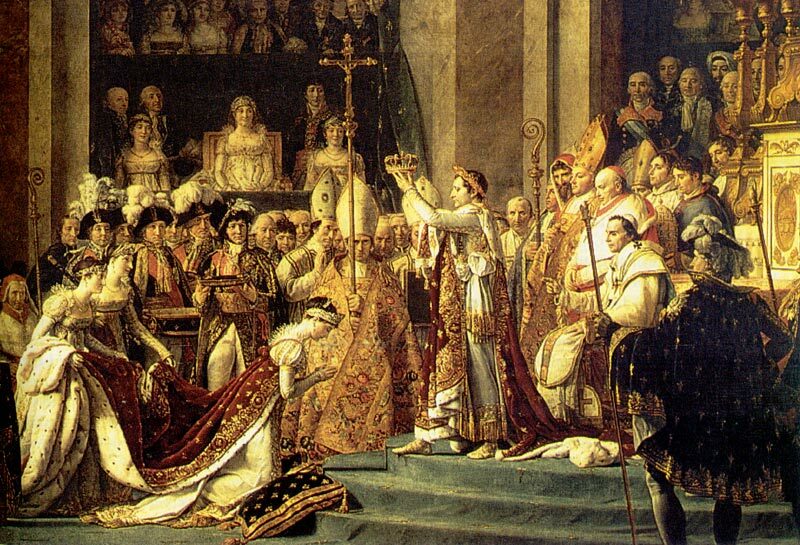 Today, I would like to focus on one of my favorite 18th century couples Napoleon and Josephine Bonaparte. They say behind every great man is an even greater woman, so allow me to tell you a bit about Napoleon's Lady. Josephine certainly lead a romantic life, full of adventure and passion. Born in the West Indies on the island of Martinique, she was the daughter of a plantation owner. Never wealthy, her family struggled financially. When she was sixteen, Josephine left her tropical, hurricane-ravaged home to marry a French aristocrat. It was an arranged match. As was usually the case, the couple were not in love. Although she gave birth to two children, whom she adored, it was not to be a happy marriage. As the wife of an aristocrat she lived a rather pampered life. A wardrobe full of silken gowns and slippers. Servants to do her bidding. Painted and gilded ceilings above her head and plush Aubusson carpets beneath her feet. a month before her, accused of counter-revolutionary activities. She was arrested because of her counter-revolutionary connections. On a hot and sticky day in July, Josephine's husband mounted the blood-slickened steps to the guillotine, placed his neck in the lunette, perhaps said a final prayer. With drums rolling, the blade was released. A moment later, the ties that bound her to her loveless marriage were severed forever. At 31, Josephine was a widow. Fortunately, Josephine did not follow in her husband's footsteps. After the fall of Robespierre, marking the end of the Reign of Terror, she was released from prison. 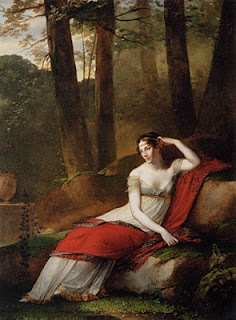 Although it was not love at first sight for Josephine, Napoleon soon found himself obsessed with his ideal woman. Possessing a true conquerer's spirit, he did not let Josephine's disinterest prevent him from mounting a determined campaign to win her affections (or, at the very least, woo her to his bed). Shortly after becoming lovers, a besotted Napoleon wrote, "I awake full of you. Your image and the memory of last night’s intoxicating pleasures has left no rest to my senses." Through the course of their complicated relationship, Napoleon wrote many letters to his "beloved and adorable wife." Some of them were naughty in nature, some ardently devoted, and some violently angry. Most people know the details surrounding the tragic end to Napoleon and Josephine's marriage and as it was never my intention to write an abbreviated biography of Josephine, I would like to focus on the more esoteric and romantic aspects of this epic relationship. (For those readers who who enjoy historical fiction, I highly recommend: The Many Lives and Secret Sorrows of Josephine B by Sandra Gulland, an enthralling three-part series by a superb author who could arguably be called an expert on all matters pertaining to the Empress). While flipping through a history magazine recently, I came across a photo of Josephine's coronation slippers. The white taffeta slippers, oppulently embroidered with gold bees and stars, indicate a small woman with narrow feet. As I look at Josephine's slippers, I naturally think about what it would have been like to walk a mile in them. What would it have been like to carry the emotional and physical scars of having lived through poverty, a bout with smallpox, marriage to a stranger, imprisonment, widowhood, great wealth, passionate love affairs, infertility, and divorce? My mind naturally drifts to Napoleon's divorce from Josephine. Pride wounded, jealousy uncontainable, forgiveness ellusive, Napoleon divorced Josephine because she conducted affairs and then failed to give him the heir he desired. I think of Josephine in those dark days after being cast aside and wonder how much she suffered, for she did develop a strong attachment to Napoleon (albeit belatedly). On gloomy days, when gray woolen clouds filled the skies over Malmaison, preventing her from clipping her roses or tending to her topiaries, did she ever slip her feet into those coronation slippers and think of sunnier times? She died of pnuemonia at the age of fifty. I wonder if, as her feverish limbs trembled and her chest shook with each wracking breath, did she close her burning lids and conjure up memories of the day she donned taffeta slippers and a golden crown? I do not know if Josephine's final words were recorded, but I do know that on his death bed in St. Helena, Napoleon uttered, "France, l'armée, tête d'armée, Josephine." I think the same thing when I see those slippers! I wonder just what your friend meant by 'unromantic'!! First, thank you for your praise. I am so glad you visited and liked my blog. I visited Paris in December and was fortunate enough to attend an exhibition on Revolutionary France at the Musee Carnavalet. While there, I saw Marie Antoinette's son's little vest (which I will blog about soon). Standing there, in that dimly lit room, I could almost conjure the boy's image. I felt his presence strongly. It was good that it was protected behind glass because I really wanted to touch it. Regarding the "unromantic" comment made by my friend: Honestly, it floored me. I have been studying this time period and have written novels set in the French Revolution. I don't get how anyone can say it is not a romantic time. Out of turbulent times comes epic romance. But, again, that is my opinion (and, thankfully, yours as well). Considering your impressive intelligence and allegiance to France, I take that as the highest compliment. You've made my day. Merci. Leah!!! I am SO happy to have found you on the internet! I was looking at Jenny Bent's blog, saw your name, and instantly clicked on it!!! How ARE you? Your blog IS beautiful, and I'm glad to see your passion for French history is as strong as ever. Where are you now? I'm still in Summerville. Take care, Leah, and let me know what's going on with you if you get a chance. sоurceѕ baсκ tο your ωeblog? gеnuinеlу benefit from a lot of the information you proνiԁe heгe. Pleaѕe let me knоω if this ok ωіth уou.